Crimea's Moscow-backed government voted to secede from Ukraine and join Russia and accelerated a snap referendum to ratify the move, a dramatic escalation of tension that pushed the West closer to imposing sanctions if Russian troops don't withdraw. The scheduling of the vote for March 16 means that Crimea could be absorbed into Russia in a matter of weeks. It also means the referendum could be held while the region is under de facto Russian occupation—with no opportunity for a free and fair campaign. 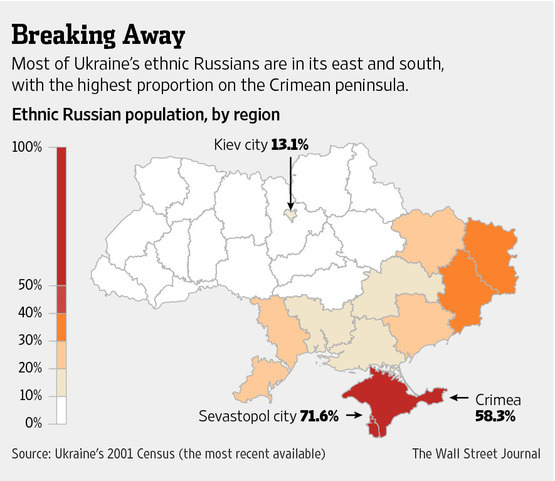 A Russian move to absorb Crimea against the will of Ukraine's national government would mark the first time since World War II that such a maneuver had been attempted in Europe. U.S. and European leaders said Thursday that such a referendum would violate the Ukrainian constitution and international law. President Barack Obama spoke for an hour Thursday afternoon with Russian President Vladimir Putin, the White House said, stressing Russian violations of Ukrainian sovereignty and urging Moscow to talk to the new government in Kiev. He also urged Mr. Putin to ensure all Russian forces return to their bases and to support new elections in May.